As I was setting up the shelves I was thinking about what was still packed away and should likely be displayed. I started thinking about what toys (not necessarily characters) have become my favorites and must be displayed on the shelves no matter what I decide to display. This mold appears twice on the list and I think with good reason. Sure he's kibbly and almost G1 in the parts department but when I was a kid, I was fascinated with a picture book I had that showed yellow firetrucks. We only had traditional red ones in Glass City. The Yellow + Fire Convoy = one of my faves. Plus... I snagged this open one from the great Zeta Convoy back in 2006 and I will be forever grateful. Far more fun than the originals in terms of posing and anime appearance. The first (and in my opinion only) Ratchet figure that somewhat captures Ratchet the character. 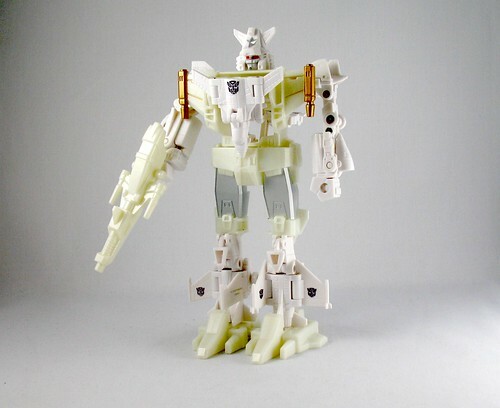 The only real legit G1 figure on the list (discounting the 2 PVCs and Micromaster reissues). 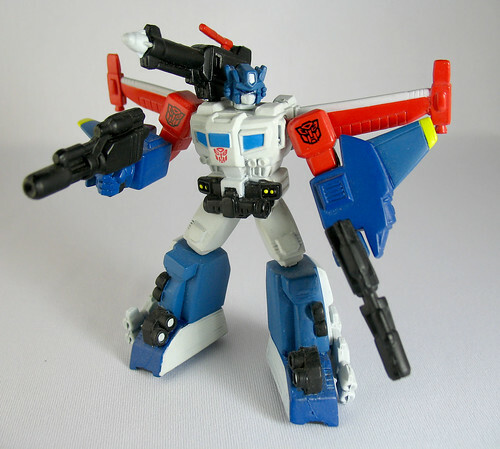 I love him more than Star Saber even though he's a total brick. There's something about this chase set that works for me. 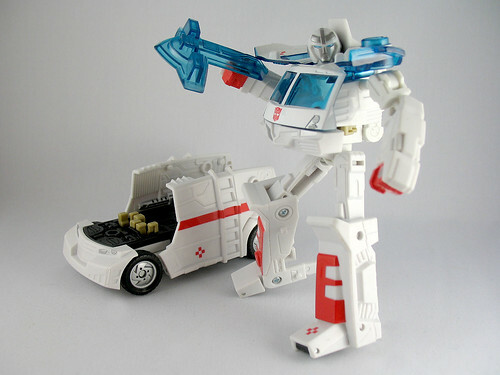 Yeah, the Japanese Micromaster gestalts are pretty simple and all, but the cohesive white and silver is really fantastic here. I love him more than I love Optimus... that much is certain. I've got the armor/trailer on order for him too. Yes. I refuse to call him Powermaster Optimus Prime with Apex Armor. He's so not that! Quite frankly, he's the only anime accurate toy (of some kind) of God Ginrai period. The actual mainline figures are just bricks. Wow! Imagine if Hasbro/TakTomy redesigned him as a Classics/Henkei Leader class figure! 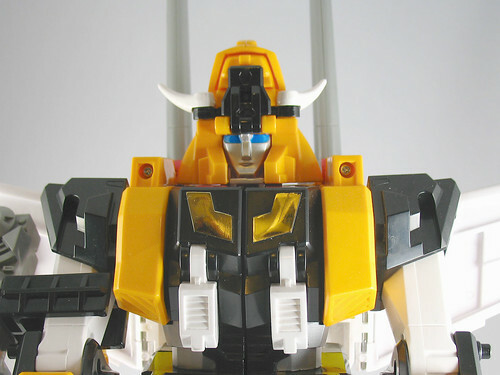 Let's face it... Galaxy Force Convoy owes a lot to him appearance-wise but he's just not the same. 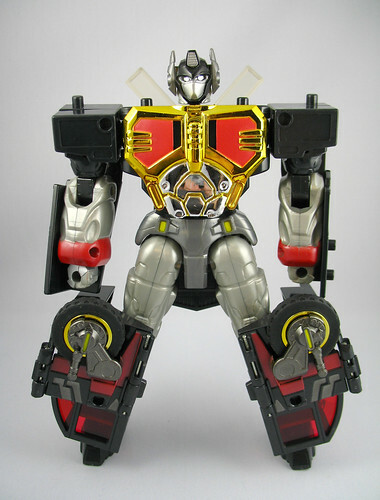 Demand a God Ginrai Henkei figure at your local toy store today! You wouldn't believe the number of requests I've gotten to buy it off me! He's phenomenal in alt mode. He's also beautiful in bot mode and poseable as all hell. And he's got a simple and effective color scheme. Yes. A retool and repaint of Cybertron Clocker comes in #2. He hits every Nala-specific love. Simple color scheme with predominantly 2 colors + a detail color! A little translucent love there on his wheels! He totally evokes his previous form too which really gets bonus points in my lovefest for him. Well duh! 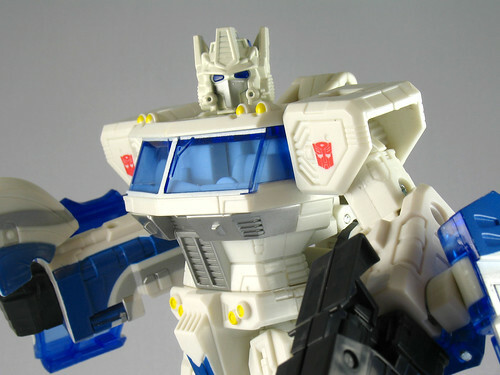 The holiest of holy grails will likely always be my #1 Transformers toy. He's simply perfection in my eyes. 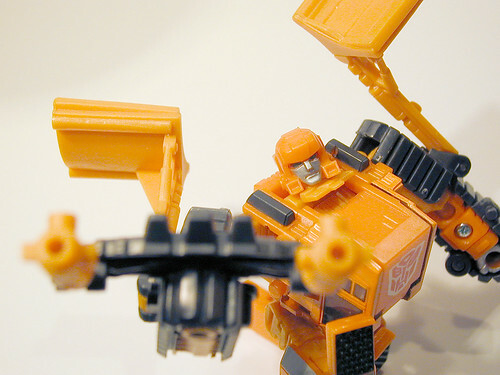 Indirectly, the Fire Convoy mold will always have a special place in my heart since it was with the reuse in Robots In Disguise that got me back into this sick and disgusting habit. Man, that's some nice stuff! The only one of them that I own is Classics Ultra Magnus. I think I'd like to get the armor too. 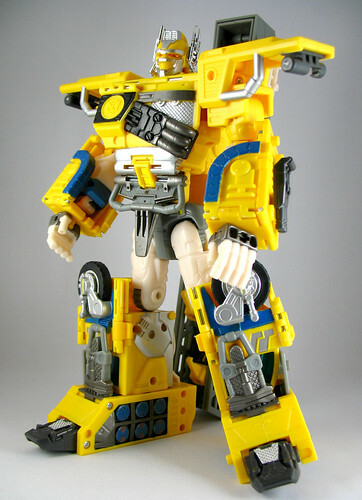 By the way, I had no idea that I'd like the yellow RID Prime, as I hate the color yellow usually. It's a really nice piece! 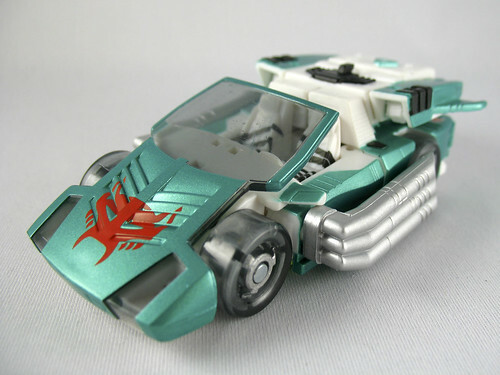 And as far as Ratchet is concerned, here's hoping the Classics/Henkei one looks good, because as much as I like this one, I just can't afford it! Yeah. I think they'll do a good job on this one. I have only seen a few prototype shots of him but on the whole, the new molds for Classics have been more or less solid attempts to redesign the guys. The new Robot Master molds were, as the kids say these days, totally sick. So exciting to have those two in the collection (particularly given how happy I was to have the deluxe PVC versions). What I love about Botcon Ratchet (and Ironhide for that matter) is that they are not only tipping the hat to the cartoon but also to the old toy. I for one actually liked the odd little leftover Takara van that became the original toys. I don't know what it is - the absence of a head, the small body, the lack of any real weapons. When I first saw pictures of him, I thought he sucked. Then I sent away for him as a mail-in in my wilderness years (when Transformers were hidden from peers - like that could happen today...) and his arrival was love at first site. Great ones. I only have the Robot Masters set though. 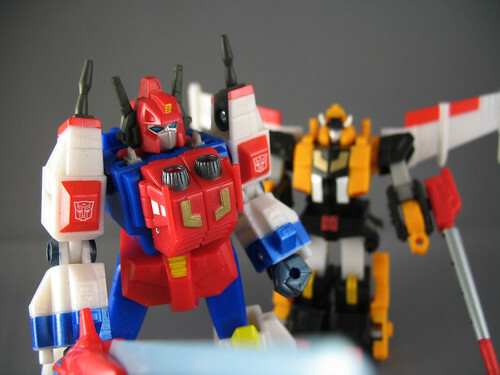 I'm hoping for a repaint of Towline at some point, and maybe a repaint of RID Prime into Hot Spot. Nala's top 11 TFs = awesome post!! Although, since there are 2 figures at position 10, doesn't that technically make the list the top 12?? I've got Classics Ultra Magnus, RID Wedge (Target Devastator repaint version), TF Universe version of Sixwing, and RID Red Prime - and they're great. 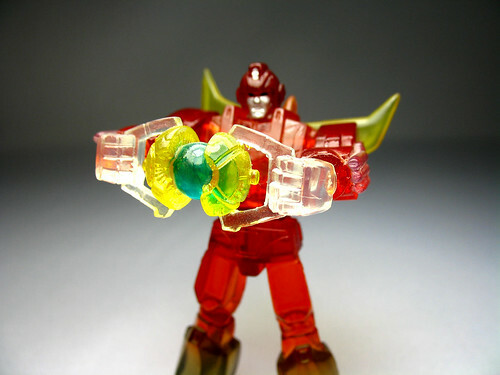 I only wish I had the Botcon Ratchet. Originally I was using Robot Masters Victory Saber as the example but then went with the pic with the 2 separated. 12... 11... hell... if I counted the Micromasters as individuals for this post it'd be even higher. This page contains a single entry by Nala published on September 9, 2008 8:50 AM. Munny Shockwave was the previous entry in this blog. Robots In Disguise Skid-Z... he's simple but fun... is the next entry in this blog.